- Gets back (after a good lunch) mid afternoon. Hop on an authentic tropical rafting adventure geared for the whole family (ages 5+) in Costa Rica’s popular Manuel Antonio National Park! 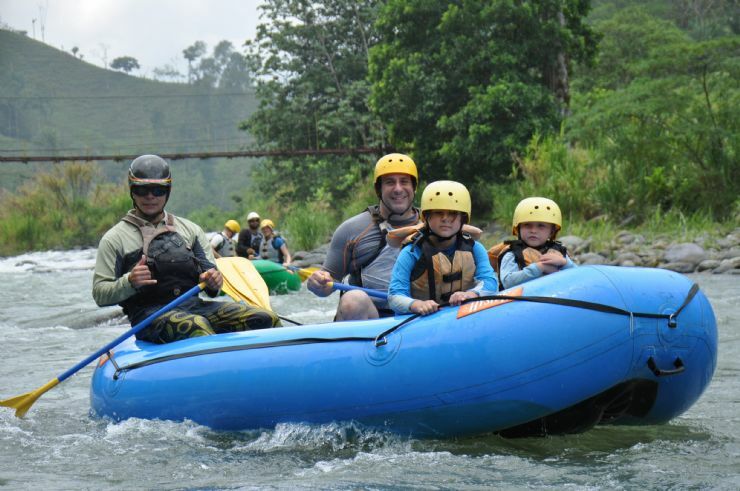 ​Enjoy relaxation and just a touch of white-water action on one of the cleanest rivers in Central America. The free-flowing Savegre River has Class II-III rapids for a gentle ride with some exciting rapids for thrills. Along the way you will be astounded by the awesome canyons, waterfalls, and primary rainforest of Costa Rica. The Savegre river in the Manuel Antonio area is a magnificent stretch of whitewater that begins its course slowly winding out of a sparsely inhabited valley in the mountains as it heads down to the beautiful Pacific Coast. This is one of the most pristine rivers in Costa rica, and is surrounded by impressive views of the primary rainforest. The lower section of the Rio Savegre offers lots of exciting white water rapids, but the action is NOT so demanding that you won't have time to enjoy the spectacular tropical scenery. And Lurking just behind the shroud of lush foliage, you will find a number of truly magnificent tributaries of the Savegre. 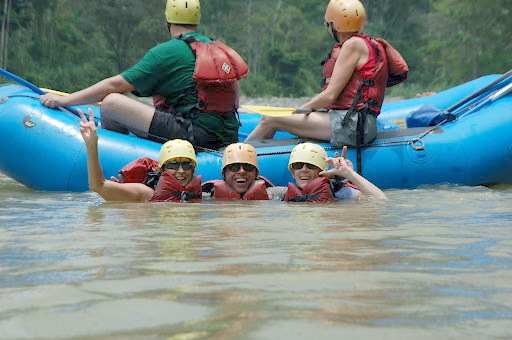 In the rainy season, the rapids increase, and make this rafting experience even more exciting! The guides stop at locally known swimming spots and breathtaking waterfalls if rafters want a break from paddling. And there is always time to enjoy spotting wildlife along the river. On good days, it's possible to observe all types of tropical Costa Rican birds including parrots and toucans, as well as other local species in this beautiful protected tropical rain forest of Costa Rica's central Pacific coast. During this great rafting trip to such a beautiful Costa Rican river, you might be able to do a few extras, such as swim in and explore the natural swimming pools in the tributaries to the main river. Enjoy this adventure of 13 miles down the river, and then savor a well deserved hot lunch! And then the trip home to your lodging. and bring a swimsuit, and insect repellent. Don't forget your camera and memory space! Please Note that all tours and prices are subject to change and availability. Scheduling is approximate. Wildlife seen will vary on each tour, and tours run rain or shine. If in the unlikely situation that river and weather conditions are unsuitable, the head guide might make the call to cancel or postpone the tour and/or offer an alternative activity for the day, credit, or refund.